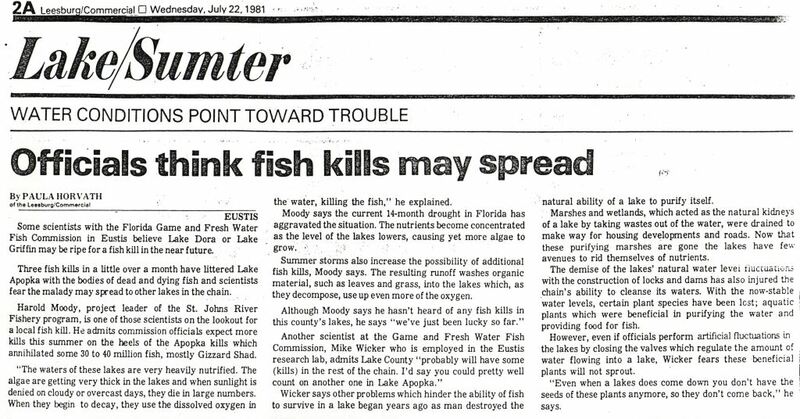 A newspaper article published in The Leesburg Daily Commercial discussing fish kills that occurred in Lake Apopka in June of 1981. The article gives quotes from Harold L. Moody and Mike Wicker of the Florida Game and Fresh Water Fish Commission (GFC), who state that further fish kills are very likely to occur. The article states that the current drought conditions in Florida were exacerbating the poor condition of the lake, concentrating the lake's water and promoting the growth of algae. The algae growth causes the lake's oxygen levels to drop, triggering fish die-offs. The Lake Apopka fish kill is estimated to have killed between 30 million and 40 million fish. Lake Apopka is one of Florida’s largest lakes and was once considered to be one of the world’s best lakes for bass fishing. The lake’s sport fish population began to decline in the 1960s, with major die-offs occurring almost yearly. The lake’s problems are generally considered to be the result of over-nutrification from various sources. Twenty thousand acres of wetlands bordering the lake’s north shore were drained in the 1940s and used for highly fertile “muck farms.” These farms were routinely flooded to protect the fragile soil, and the fertilizer and pesticide-laden water was then discharged back into the lake prior to each growing season. Other sources of pollution include discharge from citrus processing operations, as well as treated wastewater from sewage plants. The nutrient-rich discharge promoted algae growth in the lake, turning the water to a green color, and blocked sunlight from reaching aquatic vegetation, which provided food and habit to the lake’s fish population. The lake’s bottom soil became increasingly “mucky,” also disrupting aquatic vegetation from taking root. Restoration work on the lake began in the 1960s with attempts by various agencies to remove “trash fish,” such as gizzard shad, from the lake via seining, which would hopefully allow the lake’s sportfish to thrive. The Lake Apopka Restoration Council, an initiative formed under Governor Claude Kirk (1926-2011) in 1967, launched several studies to find methods to improve the lake, though no serious action was taken. Various methods were debated to restore the lake through the 1970s and 1980s, including “drawdown,” which entailed completely draining the lake to allow the mucky bottom to consolidate. Restoration attempts were stalled for lack of funding and research. The Lake Apopka Restoration Council was reformed in 1985 under Governor Bob Graham (b. 1936), and, in 1987, the Surface Water and Improvement Management Act was passed. Together, these actions allowed comprehensive restoration plans to take shape, such as the Marsh Flow-way, a project by the St John’s Water Management District that uses natural methods to remove nutrients from the lake. The Friends of Lake Apopka, a citizen environmental advocacy group, began to push for further restoration efforts in the 1990s. The lake’s north shore muck farms were eventually purchased by the State of Florida, helping to reduce the amount of nutrient entering the lake. Photocopy of original newspaper article: Horvath, Paula. "Officials Think Fish Kills May Spread." The Leesburg Daily Commercial, July 22, 1981: binder 1981, Friends of Lake Apopka Archives, Ginn Museum, Oakland Nature Preserve, Oakland, Florida. Digital reproduction of photocopied newspaper article: Horvath, Paula. "Officials Think Fish Kills May Spread." The Leesburg Daily Commercial, July 22, 1981. Binder 1981, Friends of Lake Apopka Archives, Ginn Museum, Oakland Nature Preserve, Oakland, Florida. Originally created by Paula Horvath and published by The Leesburg Daily Commercial. Copyright to this resource is held by The Leesburg Daily Commercial and is provided here by RICHES of Central Florida for educational purposes only. "History of Lake Apopka." St John's River Water Management District. January 28, 2013. Accessed June 5, 2016. http://www.sjrwmd.com/lakeapopka/history.html. Horvath, Paula. 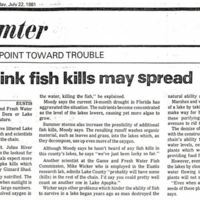 “Officials Think Fish Kills May Spread.” RICHES of Central Florida accessed April 20, 2019, https://richesmi.cah.ucf.edu/omeka/items/show/7968.